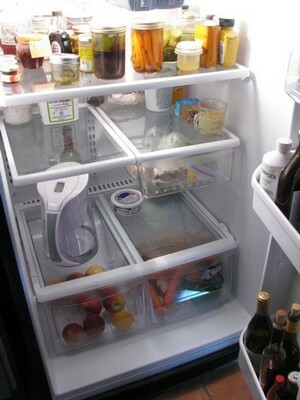 I’m happiest when the fridge isn’t full. As for the cupboards, I prefer them slightly echo-ey with emptiness. It forces me to be creative rather than reach for the same old stuff. In fact, some of my best meals were born from the very luxury of having almost zip to work with. Because, the truth is, we’re richer than we think, most of us anyway. It began to annoy me how all that stuff I’d drag home regularly from the grocery store often got wasted or shoved behind a hundred other things until it went stale or mouldy. So I gave up shopping for a month. Not a bottle of juice nor an egg came into the house. And, considering that we didn’t start out with much, we quickly got done to what appeared to be nothing. At one point I nearly caved, nearly went out for a dozen eggs. Just eggs for gods-sake… But that, of course, was the purpose of the experiment. Not to get what I thought I needed, and just see what happened. Well, what happened was I made things without eggs. Instead of an omelette I made quinoa sautéed with shallots and found some Parmesan that was getting old but still shaveable, barely. I sprinkled on some cayenne, added a dollop of sweet butter. I found a bag of frozen peas, tossed in a few, then remembered a recipe for pea soup that called for the frozen variety. Delicious. I liked having so little in the house that it was impossible to forget about anything. When the month was up I slowly began adding single items and then a few more, but my shopping habits and way of cooking had been permanently altered. Not for any reason other than I love food and injecting a certain amount of forced foraging has turned out to be the best way I know to eat creatively and well every single meal. I call it ‘found food’. It keeps things fresh. And fun. And I spend $$ more wisely. I buy less but better quality, local suppliers as much as possible… real food, in season. Yup, it costs more—it costs the price of real food. But it turns out this isn’t the problem you might imagine it to be. Because I buy less, and use it all, there’s no waste and so the $$ actually work out to my advantage. And… (and this is no small thing) to the advantage of farmers. Rather than to the advantage of the VIPs of corporations that would like you to believe that food is cheap and comes in a box. And that it somehow still nourishes you when the ingredients are mostly synthetic, manipulated, or produced with antibiotics, pesticides and the better half of Agent Orange. Oh, but it’s cheap! the VIPs shout from their corner offices or villas in Spain. It’s so cheap you can buy lots and lots and throw most of it out! My personal battle cry is real food, please! And my plan of action is to buy less, pay more, choose wisely, and eat better. Welcome to my rant fridge forage. Also… if you work with what you have you always have what you need.